Well it’s that time of year again and we are really proud to let you know what we have done on your behalf this year. During the year I was contacted by The Kids Cancer Project as they needed some cutting capes with their name on them for their Shave For A Cure fundraiser. During the process of this sale, I was dealing with a lovely lady called Dee who told me that the sponsor they had for the capes had fallen through. 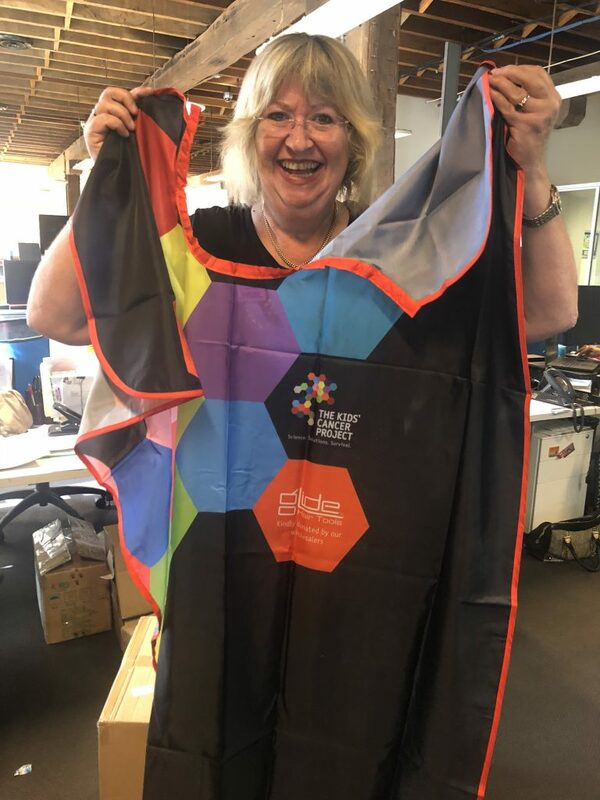 Dee proceeded with the order and we had 200 capes manufactured and printed for them to distribute around Australia. Remo and I really wanted to help, so we decided to sponsor The Kids’ Cancer Project. As a thank you to all our Wholesalers in 2018, we have donated these finished capes (see image of artwork to the left) to The Kids Cancer Project on your behalf and would like to thank you all for making it possible. When you have time please spend 30mins watching Australian Story on the link below. It is truly inspirational…..
Where it all began Founder, Col Reynolds OAM, has a steely focus to make a difference to the lives of kids living with cancer. It all started on an ordinary day in the late 1980s when Col was driving his empty tourist coach past the Children’s Hospital in Camperdown, Sydney. After stopping to let two youngsters with bald heads cross the road, he parked and went into the hospital on the spur of the moment. Touched by the spirit of everyone he met that day, Col started his personal mission to help kids with cancer in any way he could. Early on, he learned the only way to improve outcomes for these children is through advances in medical research. This Australian Story program centres on a remarkable friendship between a top scientist and a coach driver with a brave dream to do something about childhood cancer.